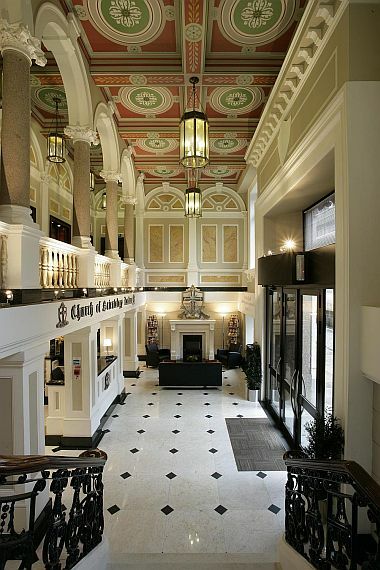 Foyer inside the Church of Scientology on Victoria Street, London. When the new Church of Scientology of Pasadena opens its doors in the city’s historical core this summer, it will not only enable the Church to expand its service to the community, it will give back some of its cultural history. Listed on the National Register of Historic Places, the character of what was once a turn-of-the-century bicycle factory has been transformed into a unique blend of old and new, its four-story atrium and original façade still intact. With attention also given to 21st century detail, the restored building will also be LEED certified (Leadership in Energy and Environmental Design). The Church of Scientology International has been working for the past six years on a program to acquire new buildings for its regional Churches around the world. Launched in 2004 by Scientology ecclesiastical leader Mr. David Miscavige, the aim of the program is to establish each Church in premises ideally suited for its many and varied religious services as well as its community outreach activities. So far, 19 such ideal Churches have opened, eight of them in unique historic buildings, with more on the horizon. 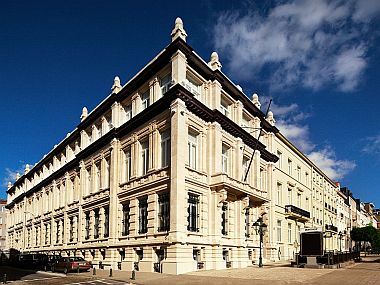 The Brussels branch of the Churches of Scientology for the European Communities situation at Boulevard de Waterloo 100-103, is an early-20th-century structure fully renovated to serve the congregation and the community. It was dedicated 23 January 2010. “These Churches have already been in their cities for many years and their buildings need to be large enough to accommodate all their activities including a chapel, rooms for the study of our theology and introductory courses for new people and individual spiritual counseling rooms,” said Church of Scientology International spokesman, Tommy Davis. Far from a Sunday-only meeting place, Churches of Scientology hum with activity seven days a week. In addition to common congregational services such as weddings, funerals, naming ceremonies for newborn children and Sunday service, parishioners can study days and evenings as well as receive the religion’s unique form of one-on-one religious counseling, participate in the Scientology Purification Program (a precise and closely supervised religious regimen that addresses barriers to spiritual gain) and take part in community betterment planning and activities, sponsored and initiated by the Church. In May the Nashville, Tennessee Church of Scientology historic building took top honors in the city’s 35th Annual Preservation Awards for meeting all safety standards while preserving the beauty and grace of the 1898 building, which opened last year. Built just two years after the famous Grand Ole Opry in a similar style, its features include red brick walls, original doors and hardwood floors, 14-foot ceilings and an unusual three-floor atrium crowned with a glass cupola. Last January, the Church opened the Belgium branch of the Churches of Scientology of Europe, an 88,000 square-foot early 20th century historic structure in the heart of Brussels. In October 2009, the Founding Church of Scientology in Washington, DC completed renovation of its seven-story, 49,000-square-foot historic building by architect Appleton P. Clark, Jr., half a mile from the White House. And another historic Church property fully restored in 2009 is the 1926 Mediterranean Revival-style Fort Harrison building in Clearwater, Florida. 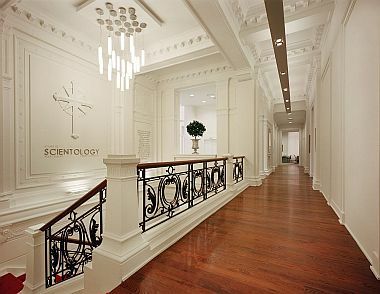 The first floor hallway of the Brussels branch of the Churches of Scientology for Europe with study rooms, offices and the a Documentation Center which holds the written and recorded works of Scientology Founder L. Ron Hubbard. Other cities with historic buildings now home to Scientology Churches include: San Francisco, California; London, England; Tampa, Florida; and Buffalo, New York. The Church has also acquired historic buildings that are in pre-construction stages in Detroit, Michigan; Chicago, Illinois; Boston, Massachusetts; Portland, Oregon; Montreal, Canada; and Manchester, England.